I’ve documented (at length at this point) my mental health journey. I’ve been extremely lucky, and I completely acknowledge that, to be able to avail of psychiatric care privately, as well as having a very experienced and understanding GP who has been an absolute godsend. I’ve also been lucky, and I never thought I’d say that, to have this not be my first rodeo. I was first diagnosed and treated for depression in early 2010 so I have the experience of what is involved in the treatment and the ups and downs. Not everyone is that lucky. Not everyone can afford what is a rather large bill, or has health insurance which can cover it. Not everyone has an understanding GP who can put them in touch with the right services in a timely manner. The waiting lists in this country for mental health services are disgraceful. There really isn’t another word to describe it. Recently, an incredible Irish blogger who writes all about her mental health journey, Fiona from Sunny Spells and Scattered Showers, was faced with the reality that the treatment which she had been promised was not going to happen. As someone who suffers with borderline personality disorder, she had been told that DBT (Dialectical Behaviour Therapy) was the best way forward for her treatment. She had been waiting for 8 months, patiently, trying everything else to get her through, and was presented with the news that it wouldn’t be happening, the resources weren’t available. She understood that this wasn’t an option for her – that this treatment had to happen – and so made the very brave act of asking for help from the public, from her friends, family, readers and others who cared to fund this treatment privately. This kind of therapy is weekly and can cost up to â‚¬120 a session – not exactly pocket change, especially for someone who is unable to work. Thankfully, faith in humanity was restored when the full amount required for the treatment for a year was raised in 24 hours. But it shouldn’t have to be this way. This should never have happened. Our government, our health service, has failed and has left it to people to ask, beg, put themselves out there and make it happen. This story has worked out well, but I do wonder just how many others looking on, who may be in the same shoes, have just said “No, I can’t do that, I’ll have to go without”. Mental health stigma in this country, while reducing over the last few years, is still alive and well, and for a lot of people putting themselves out there, like Fiona so bravely did, is simply not an option. Instead, they continue to suffer in silence and wait for the state to come to their senses. Even when the system is “working”, as it currently stands, it is flawed in so many ways. The waiting lists for treatment in mental illness in this country don’t even bear thinking about. People who go to A&E departments asking for help, admitting they cannot cope, are sent home with letters for their GP instead of being given the help they so badly need. In programmes that are available for talk therapies, there are a very limited amount of appointments given. In some cases (like the Counselling in Primary Care initiative run by the HSE) just eight appointments. This can leave patients in an even more fragile state as the can of worms has been opened and they are left without a lifering. This, in my opinion, is negligent care by our health service. We have seen such horror stories over the last few months in our mental health system, that we cannot deny its flaws any longer. Our economy is growing, the recovery is coming along, according to the big wigs in government trying to get back into the power seat, but our people are being allowed to suffer and die without a thought. Or rather, with the main thought being “What else can we pump that money into?”. Psychiatric care is not considered a priority by this government. The initial 35 million ring fenced allocation was fought for in the budget, as initially they did not care to allocate anything. Now it’s being torn apart and all that it will cause is more hardship. We’ve seen cases like that of Caoilte O Broin, whose dual diagnosis of addiction and mental health issues affected his eligibility to be treated, resulting in his untimely, and utterly preventable, death. Like that of Dan Clear, a 17 year old young man, who told psychiatrists that the treatment he was receiving was actually making things worse, whose words were not listened to and who met his tragic end shortly afterwards. There are numerous other cases numerous failings in our health service, and these are not being addressed. They are being pushed under the rug so that the image of our great recovery can be the forerunner in this current political climate. We all know the health service as a whole is a shambles. We know that conditions for those who work in it are poor and this leads to mistakes and negligence in care. The numbers of patients on trollies are climbing and there are only limited funds available. However, we can not allow the “Invisible illnesses” to lose their traction and lose the supports they so desperately need in an attempt to balance up one of the more visible people-pleasing governmental departments. Una Mullally, the other day, wrote an excellent piece which spoke to me about the purpose of health insurance. While it does definitely cover an awful lot of crippling costs on sick people, the main benefit of it, in this country, is the ability to skip the queue, to be seen faster, to be taken seriously in a much more realistic time frame. This is an absolute undeniable failing of our current health service and is very much so evident in our mental health system. 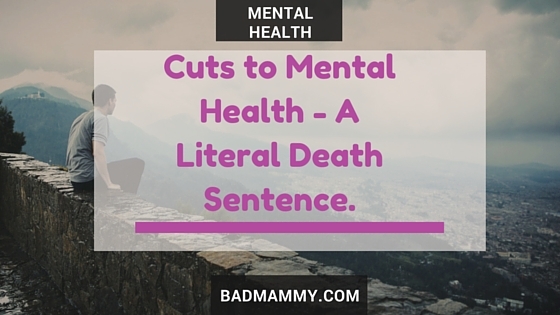 My experience of psychiatric care in this country is exemplary – because I was able to pay. I could accept my GP’s recommendation to see a private psychiatrist, close to my home, and was seen within two weeks, while being under excellent care from my primary physician. In college, when I was first diagnosed, I had a similar experience. The incredible staff of University College Cork’s Student Health Centre definitely have an all-in service that ensures the best possible care for their growing student population. As third level education becomes less affordable, and our employment crisis continues, those who cannot avail of either private health insurance or these kind of services increases. Those who need the help are left to wait and hope. Hope for a change. Hope our country starts to put their needs before the needs and whims of a government who frankly couldn’t organise a football team for the Under 10s team at the moment. Our general practice system isn’t able to keep up with the demand. A lot of services for mental health are now community based, charity led – volunteers who have stepped up unable to watch this crisis develop further without doing their part. It is heartening to see our society step up – but it is allowing the government to close their eyes, stick their fingers in their ears and ignore the crisis unfolding before it. So, future government, whoever you are, whether you manage to get it together this week, or send us back out to the polls, I ask you to think about it. If it was your child, your parent, your sibling, your best friend. Do you want to face them and tell them that the service they so badly need is just not high enough a priority for you? It is easy for those in these high paid positions to be flippant about the needs of those in less-well-off economic circumstances – unless you have experienced it, it can be difficult to stand in those shoes. All we ask is for some common sense and some eyes to be opened about the current situation. Do not cut mental health funding. Please. Â We are barely hanging on as it is with our limited resources. A list of HSE Mental Health Services can be found here. Pieta HouseÂ deals with suicide and depression. The Samaritans can be reached 24 hours a day at 116 123. To be fair, it’s hard to have a gov that gets everything right to everyone’s liking but this is so true. It’s something we just cannot skimp on. I’ve had close people in my life who have been affected by depression one way or another so I fully agree with you on this. Great post. I think it’s important to note that we, as a nation, voted this government in. Well, the small percentage of those who bothered to turn out at the polls in the last election did, and now we’re all suffering the consequences in one form or another. It’s a sad state of affairs. It’s awful. My son hasn’t had an appointment with the mental health services in a year. The last appointment he had lasted 8 minutes. The government wonder why people are taking their own lives. There just isn’t any help for them. 8 minutes, that’s a shambles. There simply isn’t enough being done. I hope your son gets seen soon, and that you’re all keeping well.